Boyd and Sky chat about his abilities as a father…she can't imagine a better or dedicated dad. 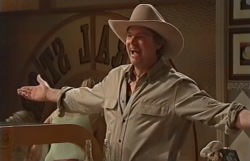 Suddenly they are interrupted by a loud man decked in an akubra – it is none other than Joe…Mangel that is. “G'day chook” he greets and Sky runs over to give her daddy a huge hug. “So you think you might get back with Susan…?” asks Phil and the rest of the Kusan fans. Karl thinks not. Oh. They change the topic so Doug and Phil talk about THE famous cricket match. +switch on commentary voice+ Well, they've been playing all avo and scores were all a level when suddenly Doug CLOBBERED the shot straight up the street and smashed Lou's window….phew. Those were the good old days. SMASH! That was the sound of Karl breaking the picture with Izzy's ultrasound photo. He rants about how Izzy framed it to mask the date, or how she lied so he would not go to the scan. KARL: Everything that the girl said was a lie. That's the good old days, right there Annalise! Annalise, Lance, Doug and Phil excuse themselves, leaving Toadie to console Karl. Karl simply states he loved Izzy, grieved for their baby, their loss…but all she ever gave in return were lies. Plain and simple. Joe explains to Sky he heard about Annalise (of course who hasn't now?) and the screening so decided to head down…and of course visit her. He gestures to Sky and asks if it's “Floyd”, her special fella? Sky corrects that they're just mates now and points out that Boyd is now with Kayla (who is holding her baby). Joe, not so smoothly asks if she's 16 and Boyd shoots him a dirty look. Sky tries to explain, but Joe keeps on assuming – fooled around with his little girl and got another one in trouble! Sky states Boyd is just trying to do the right thing with a baby that isn't his…yeah. Harold comes out and Joe yells out HAZZA and begins tickling/squishing/poking him like a marshmallow. “Look at him go” hehe. Joe explains again why he's here – to be famous. A good looking guy like him? And of course, his good looking daughter and gives Sky another hug. The cul-de-sac is a blaze with balloons and other pretty party decorations. Susan, and well the entire cast have come out to part-tay. Lyn shows Oscar the pretty colours and he goes gaga over them. Lucy walks by Doug and Phil in a huff, and in turn they make a snide comment about the Robinsons… Meanwhile, Toadie tells Suse he has never seen Karl so bad. He says Karl may come later, but feels he was a bit embarrassed. Lance asks Toadie for help, as Annalise needs assistance setting up the broadcast. Suse then bumps into Lynnie and they make some small talk about the weather…Cut to Max and Boyd, whom are pondering throwing a tennis ball. Boyd demonstrates but unfortunately he throws quite badly and the ball Annalise. Toadie yells that they are working! ANNALISE: Correction I am working. You are looking up my skirt. LANCE: No, we're admiring…your talents as a film maker. TOADIE: That's right. You make Michael Moore look like a fat bearded guy! “You're not wearing your leg” slightly random statement to make, unless you are Paul (or missing a leg). Karl reprimands Paul, reminding him he needs to get used to it. Paul is stubborn and simply refuses. Lucy visits and starts on him too – she isn't going to the celebrations without him. Pulling out the leg, she gently introduces Paul to his new right leg. Let's name him leggy. Literally all of the street is out in force, either helping out on the BBQ, throwing balls around or mucking around. Kinda sweet. Lou finishes telling Doug and Phil that unfortunately, he has to bail on the fishing trip. He points to Harry, and says he probably won't be able to manage without him. Susan and Lyn finally get a chance to really talk, although quite tentatively at first. Susan hopes Karl will turn up…he should need his friends right now…adding in, they all do. She apologises for keeping the Isabelle secret – she didn't believe Lyn would spill the beans, but rather she had so much on her plate. And…didn't think she'd approve of her extraction methods. LYN: Interfering with someone else's medical records? It's absolutely disgusting…(Susan hangs her head) It's exactly what I would have done! They share a grin and giggle. Kayla and Boyd continue to worry about why the grumpy man is taking so long, but Boyd is sure things will be okay. SKY: Yeah, the gossip. The rows, the barking dogs. Joe reminisces his time in Ramsay Street, particularly how he'd play cricket on the street with Sky running around. Sky doesn't quite remember that…nor does she remember learning to ride her bike with bark all up her legs. Confused, she tells Joe he must be thinking of Toby. He agrees, hehe. Annalise, Lance and Toadie simply stare at their reflections in the plasma screen. She sighs, obviously they will have to move as it's too bright here. Joe comes rocking down, and brings some lamingtons to Lyn. Lyn doesn't really say anything…shy Lynnie, but takes it, grinning. 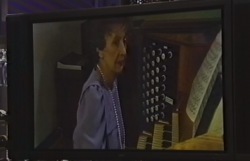 Annalise is now talking to the women, explaining they need to initiate PlanB – move the showing to the Scarlet Bar. ANNALISE: Trust me, I never had this problem in the UK! The grumpy mans, still looking so very grumpy, finally leaves the Hoylands. Kayla and Boyd rush inside. 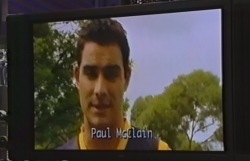 PAUL: I'm Ramsay Street's newest resident! Cut to David, Serena and Lil looking quite perplexed/annoyed/worried. Max tells Kayla and Boyd the department knows how they broke all the rules…how they think they became proxy parents and tried to persuade Kayla to do what they wanted. Kayla wants to explain, but it's TOO late. They have been taken off the adoption list…permanently! 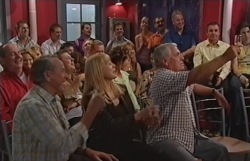 All Ramsay Street residents and extras are patiently seated at the bar (who knew it could fit so many people, it's like a fire hazard), waiting for the showing to start. Serena is visibly annoyed that Paul is there, and we see Paul simply grinning in the background. Lil looks a little concerned. Connor runs in at the last minute and is introduced to Lance. TOADIE: Actually this is Lance. CONNOR: Oh hello Lance, how are ya? Karl arrives and Susan is glad he came (though they don't sit next to each other)…Max also didn't want to go, but Steph insists they need a laugh. Annalise stands and thanks them for coming. She explains the doco is just a rough cut, as she has more footage to add. 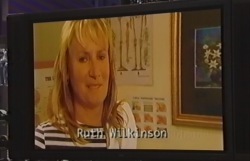 She thanks Harold, Lou and Lucy for their home movies. ANNALISE: (standing in Ramsay Street) Ramsay Street, Erinsborough Australia. (flashes of the street) The blank suburban canvas on which I lived a large part of my life. (flash to house numbers) The street, I'd forgotten about until I was approached to do this film. What did this place mean to me? What did I learn? I couldn't easily answer these questions myself. So, I started asking around. 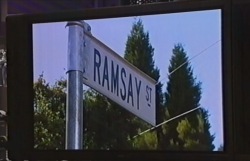 Ramsay Street? Yeah! It was named after MY family, the Ramsays. Well I suppose I could say that's where my son Matthew and I found each other again. Ramsay Street had a big impact on me. Really good people. When I first showed up I was this shy little thing, too scared to even breathe. Thank god I got over that. I toughened up when I started working in the business. You know what, I realised what I wanted. Jack. Aww it was a lovely street to live in! Really lovely, it was warm and welcoming. Ahh Libby, she was way too young for me. Plus, her dad was a bit of a control freak. G'day Dr Karl. LIBBY KENNEDY: Families. Definitely families. Don't you think? So Libby if you're watching and you ever think of leaving him again, then just give me a call. Hmm? I'm only joking mate. Community. And really good mates. Lou took me under his wing, I can't thank you enough Lou Carpenter. Anyway, Ramsay Street let me have my dreams. Everyone there, Harold. Hi! Hey to my stepdad Lou, hope you're okay. (blows a kiss) I'm looking after Jack, Mrs Scully! Okay let's get to it. The best thing about living in Ramsay Street. Number one, is family. No question, lived it. (to taxi driver) Here you go mate, thanks. I was obsessed with climbing any corporate ladder people could throw at me. My own fashion boutique. And I still am in Darwin managing Lassiter's. London is so much more my scene. (Susan and Karl look down) I mean, no one here would ever, ever, send me a fluffy white dog that looks nothing like Bob and expect me to believe that it's him. Do you hear me Jarrod Rebecchi!? You conned me! When I was a kid my dad walked out on us…and then I lost my mum as well. Madge and Harold, yeah they became my foster parents. ANNALISE: (voice-over) It was decades before Madge and Harold, the childhood sweethearts, finally found their way into each other's arms. Once together their home became a sanctuary of love and support for all that passed through it. I never would have landed the gig with the Lamberts if I hadn't been so stupid as to fall in love with Marc. What a silver spooner sleaze he turned out to be. So if it wasn't for all that I wouldn't be here. In America. Where all I do is work work work….and party party party! With my little sister Shell. But we're good girls, honestly we are. 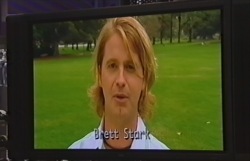 Anyway Ramsay Street people love a good gossip and I was always happy to provide whenever I had a new boyfriend. Hey, better to be talked about than not I say. (She plays with her ring finger on her right hand) I...grew up in Ramsay Street with ah, Harold, Lou, Billy Kennedy next door oh and Paul and Tad. Hi mum! (he enthusiastically waves) (Susan waves back) Hi dad! Hi everyone! Look at me. Hey? Finally out of the toolshed and off on holidays. Anne's gone shopping in the swanky Beverly Hills area and I was quite happy to leave her to it actually. I thought I'd get out and see some real sights. I'm a bit disappointed Lance isn't here. I was hoping we could catch up at one of his sci-fi nerd fests! You know I really miss hanging out with those guys…you know Lance, and Amy and Toad…Hey guys, if you're watching. And Stu if you're listening, I meant to send the ring back. I really did. But, you know how it is. A few bills…and…anyway, congratulations on your new engagement. Ramsay Street was really great though. It ah, (coughs and kinda puffs himself up) made me the bloke I am today! 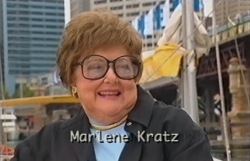 The thing I think I got most from that time was professional confidence and I owe that to my Ramsay Street years. ANNALISE: (voice over) There have been many defining moments in the life of this street but none brought people together like the wedding of Scott and Charlene. They may have moved to Queenslands, but they will forever be the kids that fell in love in Ramsay Street. 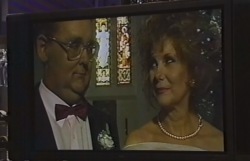 This wedding video captures the kiss that was the start of a new Erinsborough family. 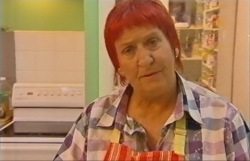 Gran was the best thing about living in Ramsay Street. I really loved her, she was always there for me and I guess she always will be. God Phil and I fought like cats and dogs when we first met. It was terrible. But Helen was great. I was a total mess when I lived on Ramsay Street. So um, yeah it was Aunty Rosemary, she made me come back here to New York and made me get my act together. And, I've never looked back. Well I suppose I should say the best thing about living in Ramsay Street was the girls! Of course only one caught my eye, hey babe? Well, we've been married 5 years and living here in London. I've never known love like it. 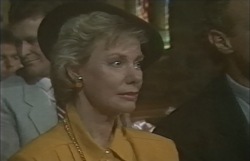 ANNALISE: (standing back in Ramsay Street) So, what did this place mean to me? What did I learn? I think I learnt that life is worth living in a community that cares. In a place where there's always someone waiting with a cuppa, a helping hand and an endless supply of kindness. Life is best lived with Neighbours. You become good friends. LIBBY: Hi mum, hi dad! GAIL: (with her apple tree) Bye! MAL: Say g'day to Dahl and the rest of the street. 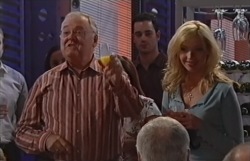 LUKE: Hello and ah, good luck to everyone in Ramsay Street. DANNI: (laughs) Can you re-edit that? NINA: Gotta learn my lines. 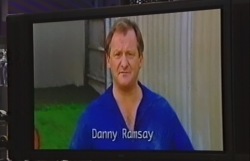 DANNY: G'day Ramsay Street, keep up the good name! 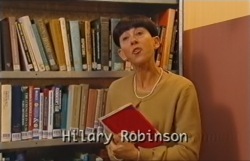 HILARY: So to everybody there. Greetings. RUTH: Hi everybody, hope you're all well. 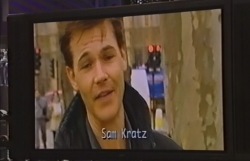 SAM: Lots of well and hi to everyone on Ramsay Street. HANNAH: Love you all. I miss you, ah email me. See ya. 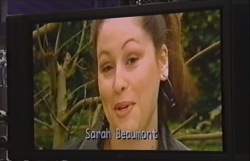 SARAH: Hi to everyone in Ramsay Street from a very cold London. MELANIE: Buh bye and hope to see you soon. Bye!